Finally, it is worth noting that competition for one resource often affects the ability of an organism to exploit another resource. For example, Buss (1979) showed that in interactions between species of bryozoa (colonial, modular animals), there appears to be an interdependence between competition for space and for food. When a colony of one species contacts a colony of another species, it interferes with the self-generated feeding currents upon which bryozoans rely (competition for space affects feeding). But a colony short of food will, in turn, have a greatly reduced ability to compete for space (by overgrowth). maize (Zea mays) and pea plants (Pisum sativum) (Semere & Froud-Williams, 2001). 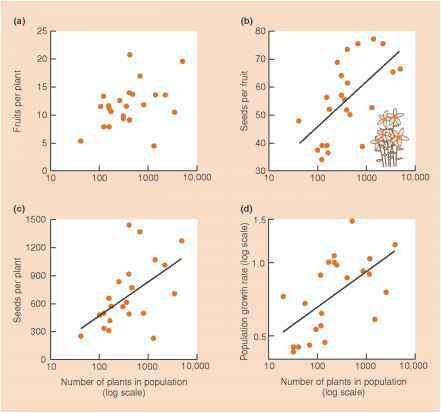 In full competition, with roots and shoots intermingling, the biomass production of maize and peas respectively (dry matter per plant, 46 days after sowing) was reduced to 59 and 53% of the 'control' biomass when the species were grown alone. When only the roots intermingled, pea plant biomass production was still reduced to 57% of the control value, but when just the shoots intermingled, biomass production was only reduced to 90% of the control (Figure 8.6). These results indicate, therefore, that soil resources (mineral nutrients and water) were more limiting than light, a common finding in the literature (Snaydon, 1996). 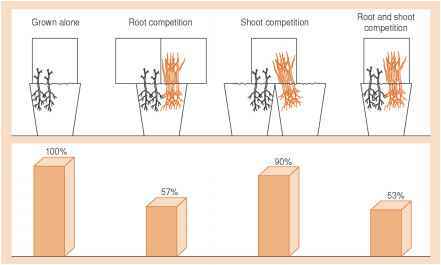 They also support the idea of root and shoot competition combining to generate an overall effect, in that the overall reduction in plant biomass (to 53%) was close to the product of the root-only and shoot-only reductions (90% of 57% is 51.3%).